Applied Integration have recruited five new members of staff on the back of two major contract wins as the Stokesley firm looks to further enhance its position as a UK leader in automation and control systems. Among the new recruits is new senior engineer Dr Ali Almohammad, who has spent the last two years as an associate of the firm whilst working on a knowledge transfer partnership (KTP) with Teesside University. Dr Almohammad worked closely with Applied Integration staff and academics within the university’s School of Computing to radically redesign the firm’s in-house project development framework. The project has developed software to streamline Applied Integration’s in-house processes, which could potentially save his new employers and their customers substantial time and money, giving the systems integrator a competitive advantage in a challenging market. “Ali has had the best interview ever,” said director Lee Raywood. “He has impressed us all over the last two years. “He has the capabilities and skill set to push the business forward through new software developments whilst expanding on his KTP work. “Over the past two years, Ali has helped to create a product that gives us a massive advantage over competitors, and we’re expecting it to make a dramatic difference as we move forwards. “We’ve carried out successful trials and we’re continuing to develop the software but it has already helped to bring about a mind-change within Applied Integration, refocusing some of our business methods. Also joining the Applied Integration team is former Middlesbrough College lecturer Lindsey Williams, who graduated from Teesside University with first class hons in instrumentation control. The firm has also recruited Saeid Gharibi as senior engineer, Richard Willingham as a technical sales expert and Martin Wadlow as a panel wireman. Director Garry Lofthouse said: “We’re recruiting after a couple of large contract wins that have increased the stability of the business in a market that’s become increasingly buoyant over the past 12 months. 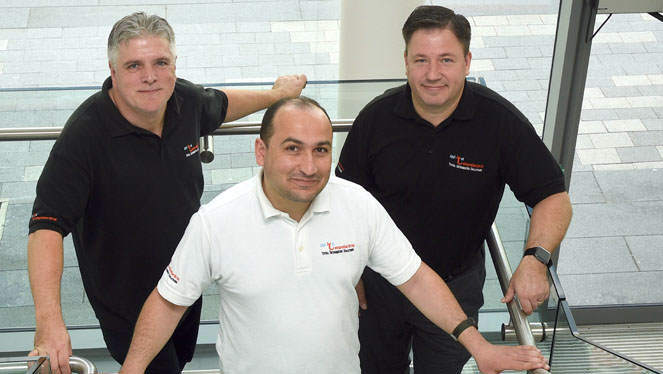 • Pictured (above): Flanked by Applied Integration directors Lee Raywood (left) and Garry Lofthouse, Dr Ali Almohammad is joining the firm as senior engineer after impressing whilst working on a KTP project.